Looking to give your new 2017 Super Duty that little extra boost for 35" tires? Be sure to replace your track bar frame mount to accommodate the extra lift to keep your front axle and suspension components centered. 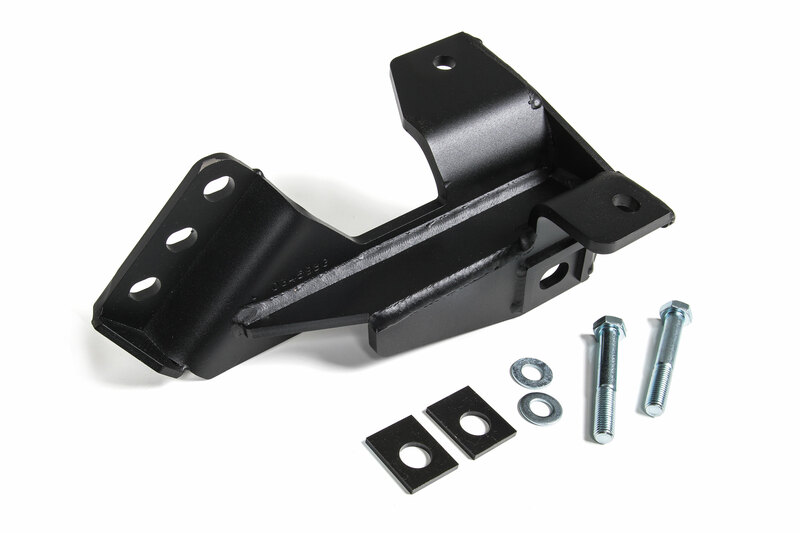 BDS Suspension is now offering a heavy duty replacement track bar drop bracket. The bracket bolts in place of the factory unit and corrects the track bar angle to keep it in phase with the steering linkage for optimal handling. The bracket is built from high strength 1/4" steel, fully welded and finished in a durable textured black powdercoat. The bracket is built to accomodate 1-3" of lift using a slotted track bar mounting hole and offset cam locks. These brackets come standard in the BDS 2" leveling kits (#1519H) and will work with most leveling and lift kits up to 3" over stock height. Get the factory track bar upgraded on your leveled 2017 Ford Super Duty with BDS Suspension. Offset cam locks allow the track bar recenter axle at a range of lift heights.